The Chaos Creek prospect consists of twelve lode claims located in the Squaw Hills and are situated in northeast Nye County approximately 53 miles south of Eureka and 75 miles northeast of Tonopah, Nevada. Elevations range from 7690 to 6500 feet (2344-1981 m) in the prospect area. 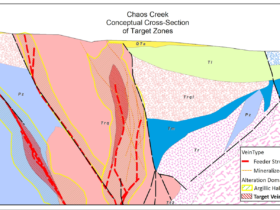 Chaos Creek is a raw prospect with potential for high-grade, epithermal precious metals veins and for disseminated gold mineralization hosted in the volcaniclastic rocks. Rhyolitic flow-dome complexes host cross-cutting, mineralized breccias. Much of the host rock is covered by post-mineral tuffs or gravel deposits. The gravel deposits are thought to be deposited in broken and altered zones of rhyolitic intrusive and felsic volcanic rocks of Eocene to Oligocene-age. A primary feature of interest is the intersection of two caldera margins along a deep-seated structural contact with the Paleozoic basement rocks. At the Chaos Creek claims, rhyolitic flow dome complexes are interpreted to be resurgent in character and are coincident with the nested margin of two intersecting volcanic centers of Oligocene-age. A deep-seated, northeast-trending structural corridor is bounded, to the west, by Mississippian basement rocks. 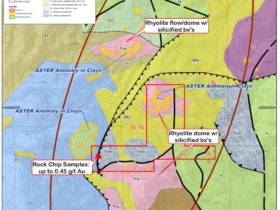 The rhyolitic domes and lavas are spatially coincident with localized anomalies modelled from remote-sensed ASTER data representing clay alteration and silicification. Surface exposures within the anomalies identified by ASTER are related to infilling and cross-cutting silica veinlets that indicate episodic pulses of hydrothermal activity. To date, anomalous values of gold up to 0.45 g/t have been discovered near the contact between the Paleozoic and Tertiary rocks. The geology, in the Squaw Hills, near Chaos Creek, has been mapped by the USGS at 7.5 quad- scale. Rock units and their field relations described by the USGS workers consider details of deep drilling peripheral to the Nevada Test Range and extensive geologic mapping in the region. Their descriptions are included in the discussion below. A primary feature of interest in the USGS mapping is the margin of the Hot Creek and Morey Calderas, where they coincide with the Paleozoic basement rocks that define the caldera margin. These two calderas are coeval and are partially nested within one another. Paleozoic rocks include the Ordovician to Mississippian age sedimentary rocks. The Paleozoic rocks form basement highs and are also included as large allochthonous blocks inside the caldera margin. Where limestone is mapped as “floaters” in the volcanic rocks, white barite veining is strong. No other mineralization has been identified in the exotic limestone blocks associated with white barite. Older volcanic rocks may also be included as exotic blocks surrounded by younger volcanic units. The northern Nye County area is a volcanic field with a wide and varied assortment of volcanic rocks derived from multiple sources and of felsic to mafic composition. Multiple volcanic centers of similar age, are evident and interfingering of the tuffs, from different vents is evident in the field. At the Chaos Creek claims, rhyolitic flow dome complexes are present with brecciation and quartz veining. The domes are interpreted to be resurgent in character and are coincident with the nested margin of two Oligocene volcanic centers. A northeast-trending structural corridor is bounded by Mississippian clastic rocks, has rhyolite domes with associated, near-source, lavas and tuffs. The rhyolitic domes and lavas are spatially coincident with clay alteration as modeled from remote-sensed ASTER data. The Morey District mineralization is described in the Northern Nye County report. At Morey, Oligocene rhyolitic tuffs host veins with ores of silver but have a more complex suite of elements that suggest deep-seated, intrusive-related processes were active. The mineralogy includes tin, molybdenum, copper and zinc-bearing minerals as well. 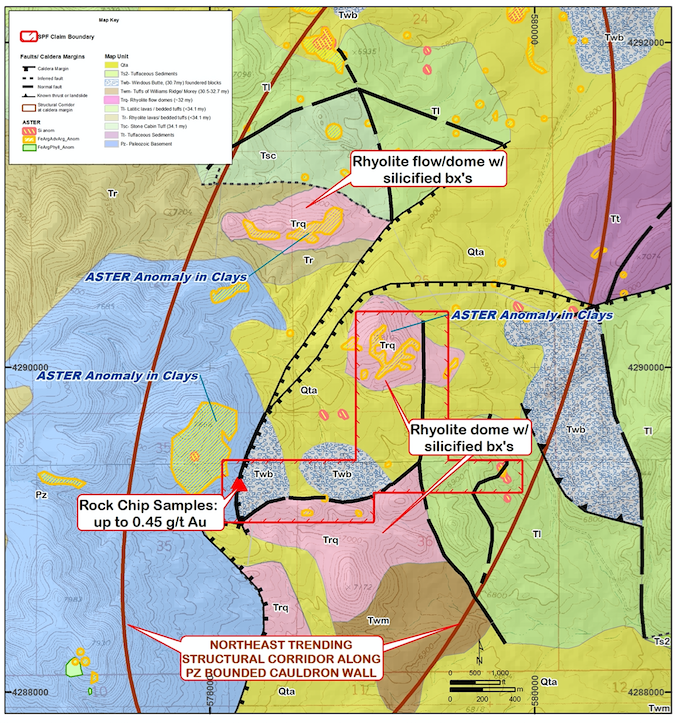 Alteration studies also suggest that multiple episodes of mineralization have been active with abundant sericite and quartz in proximity to the metal-bearing veins. Most mining activity is thought to have been carried on during the 1940’s. Exploration efforts in the late 1960’s were conducted by International Minerals and Chemical Corporation. The target sought by IMCC was for tin and silver. The tin occurs in anomalous amounts peripheral to the veins but never was found in economic concentrations. The Titus prospect, explored for silver associated with antimonial ores, is situated about eight miles northeast of Morey Peak. Strongly oxidized stibnite is present in pods and clusters of radiating masses along a northeast-striking structure. The structure is brecciated, variably silicified and hosted in the Devonian dolomites along the margin of a pair of Tertiary calderas. The relation between the Tertiary rocks and Paleozoic rocks is similar to the Chaos Creek prospect where the Paleozoic rocks are made up of Mississippian Eleana Formation within a block of Paleozoic basement. The structural block of Paleozoic rocks includes the Devonian dolomite and Mississippian clastic rocks. At the Chaos Creek claims, gold mineralization occurs in a brecciated felsic porphyry. Infilling and cross-cutting silica veinlets indicate episodic pulses of hydrothermal activity with elevated antimony concentrations. Anomalous gold is present near the margin of the Morey-Williams Ridge caldera complex at the structural contact with the Paleozoic clastic rocks of the basement. Systematic surface sampling and an IP-Resistivity survey are planned to define drilling targets. Trace element distribution, in the sampling results, will provide vectors to guide target definition. The geophysical survey is intended to create a 3-D understanding of the subsurface geometry of the older intrusive host rocks and to identify contrasting resistivity where mineralized zones and controlling feeder structures may be present.